← Friday’s Foto Fun – Boo! 19 Responses to Yappy Howloweenie! WOW! Be u tee ful!! What a wonderful Hallowennie picture! Stu, your peeps are really talented and you are specially handsome! Great Halloween photo Mr. Stuart !!! Have a fun day !! Yappy Halloween Stuart!!!!! Hope you and your furramily have a great time handing out treats! Great picture of you with the Jack-o-lanterns, Stuart!, your Halloween decorations are so festive! Keep your house safe from all the ghosts, goblins and witches that will come trick or treating today! Enjoy a safe, Happy Halloween, everybody! That is a fantastic picture. This is one of your toughest “Where in the World?” posts. Beware to Hogoblins and Ghosties tonight! Happy treating! Mom can’t type today….Beware “the”………Doh! Oooooooooo, dat’s scary, Stu! We didn’t realize dat was you at first! 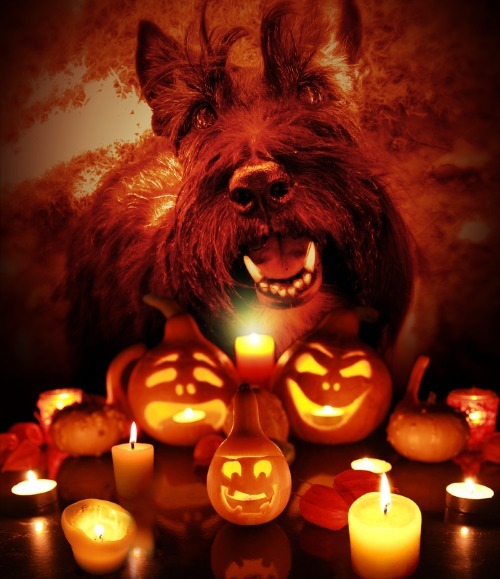 Dat’s a really good Howl-arooo-a-ween picture, dat is! If you put dat picture on your front doorstep, you will scare all of de little goblins away tonight! Don’t let da scary costumes scare you, Stu! Don’t eat too many treats! OMD, you look so skeery!